This is a fairly new oil to be used and has gained great popularity because it has some great rejuvenating properties and is helpful with fighting sun damage to the skin. 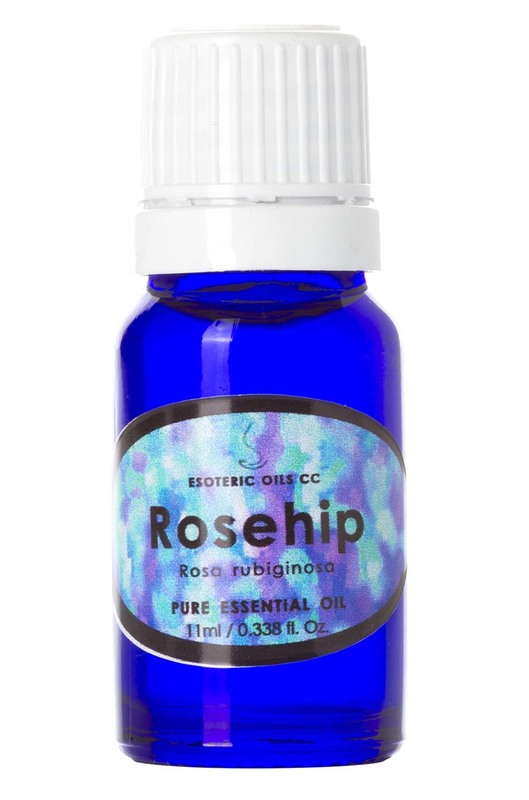 We have listed the rosehip oil under the essential oil section, although it in reality is more a fixed oil (meaning that it is NOT A VOLATILE OIL), and can be used neat on the skin. It is high in GLA, and helps reduce the signs of ageing, especially the fine lines around the eyes (crows feet) and lines around the mouth, the drying effects of the sun and climate, as well as assisting with attenuating both accidental and surgical scars. There have been some reports that it can aggravate acne, but since it is mostly used to counter the effects of ageing, this problem is not that relevant. Rosehip oil is not a volatile essential oil, yet is expensive and scarce due to crop failures, and for this reason often sold adulterated, and mixed with another carrier oil. Our product is pure and unadulterated and is from Chile. It has great healing properties for damaged and distressed skin which makes it a good choice to include when mixing a massage oil or preparing a carrier oil blend, or to use neat when wishing to give your face a boost. In a cream or lotion, or used neat on the skin, it is one of the most rejuvenating and regenerating compounds to be found, and for this reason, good quality anti-aging skincare products normally contain rosehip oil. Rosehip is a fairly new ingredient in modern cosmetic skin care products, but has gained a great following by people in the know, as it contains good amounts of vitamin C, which is not only healing but is also a wonderful ingredient in anti-aging products. We make use of rosehip oil in many of our products, to introduce the benefits of a bio-available vitamin C to the skin. This form of vitamin C in the oil medium is non-irritating to the skin, and prevents the "Fenton reaction", which is a normal reaction that water-soluble vitamin C has when interacting with the iron in the skin. A hydroxyl free radical forms in this action - which does not happen when the vitamin C in rosehip oil interacts with the skin. Other constituents include boron, capric acid, tannins, catechin-tannins, citric acid, essential oil, epicatechin, flavonoids, gallocatechin, invert sugars, isoquercitrin, kaempferol-3-glucoside, leucoanthocyanins, linoleic acid, linolenic acid, lycopene, magnesium, malic acid, pectin, protein, rubidium, rubixanthin, succinic acid, sucrose, alpha-tocopherol (vitamin E), vanillin, xanthophyll and zeaxanthin. It acts as a fixative and is refrigerant, while also having astringent and diuretic properties. It has exceptional emollient properties, while also acting as an antioxidant. It is high in GLA, which help reduce the signs of aging, especially the fine lines around the eyes (crow's feet) and lines around the mouth, as well as combating the drying effects of the sun, environment and climate. In the research done by Dr Bertha Pareja and Dr. Horst Kehl, it was found that daily applications of rose hip oil helped with wrinkle reduction, as well as fading sun damaged areas of the skin. Twenty women aged between 25 and 35 years were used as test subjects, over a four-month period, and all reported a visible improvement to the skin. Due to the high levels of the fatty acids - linoleic (47.4%) and linolenic (33%) - it helps the skin to heal and speeds up regeneration, while preventing the formation of thick keloid scar tissue (the over thickening and formation of fibrous tissue of the skin when forming scar tissue) and is helpful in healing burns, scars and stretch marks. The success rate of attenuating and reducing the formation of keloid scar tissue and loosening up fibrous cords is successful in both accidental and surgical scars. Fatty acids are essential building blocks of cellular membranes, to allow efficient transportation of nutrients from the extracellular space into the intracellular environment where metabolism takes place. Besides the non-saturated fatty acids, the presence of carotenoids, flavonoids and trans-retinoic acid has also been detected in this oil and these could be responsible for some of the pharmacological and therapeutic properties of rose hip oil. In a further study, it was found that it was useful when used on surgical scars (applied twice daily). The scars were less apparent, the skin more elastic and the color also improved significantly compared to patients not using it. The same success is reported on burns, when the oil was used to reduce scarring and returning the tissue to its normal and natural coloring. It penetrates the skins very quickly, making it a good moisturizer and with all the other positive properties, and its tissue regeneration action, it is easy to understand why it is also described as the "oil of youth".